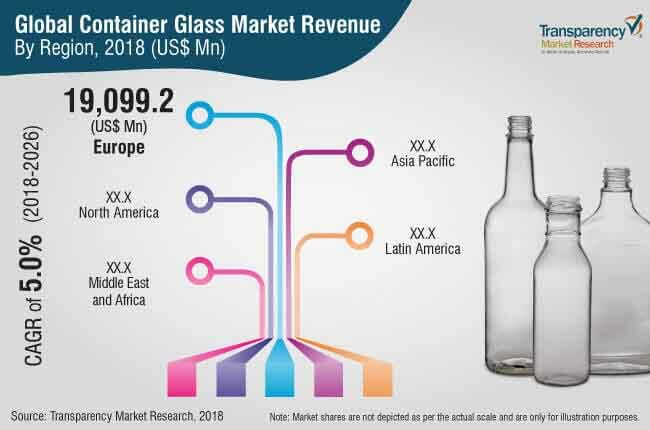 The global market for container glass was valued at US$ 52,590.1 Mn in 2017 and is projected to expand at a CAGR of 5.0%, during the forecast period (2018-2026). The global container glass market is segmented on the basis of container type as packaging, tableware, and decorative containers. The container glass packaging segment is anticipated to be the most attractive segment in all aspects, which include market share in 2018, CAGR during the forecast period, and incremental revenue opportunity by the end of 2026. The container glass packaging segment is further sub-segmented into bottles, jars, and vials & ampoules. Being highly-convenient and preferable for beverage packaging, the bottle segment is estimated to account for around 2/3rd of the global market value share in 2018, while the vials & ampoules segment is projected to register the highest CAGR during the forecast period primarily driven by the increasing adoption of vials in the food packaging industry. The container glass bottles segment is further categorized into sauce/syrup bottle, French square bottle, Boston round bottle, and other container glass bottles. Among the container glass bottle categories, simple round design of sauce/syrup bottle is majorly preferred by the container glass packaging manufacturers due to its relatively easy manufacturing process and low cost of production. On the other hand, efforts made by container glass packaging manufacturers to enhance the aesthetics have resulted in the rapid growth in demand for customized and innovative designs for container glass bottles. The container glass jars segment is categorized into Mason jar, hexagonal jar, Paragon jar, straight-sided jar, and other jars. The mason jars segment is estimated to account for around half of the container glass jars market segment value, owing to the relatively simple and cost-effective design of the container glass jar. The Paragon jars category is anticipated to grow at the highest pace owing to the shifting consumer preference due to comparatively better aesthetics and convenience in handling of the container glass jar. The container glass vials & ampoules segment is categorized into food-grade vials & ampoules and pharma-grade vials & ampoules. The container glass pharma grade vials & ampoules is a well-established market segment due to the preference for unit dose container glass packaging solution, and further projected to rise at a higher pace as compared to that of container glass food grade vials & ampoules due to the rapidly expanding global pharmaceutical industry. The demand for container glass food-grade vials & ampoules is expected to register significant growth during the forecast period, specifically in the developed economies of North America and Europe region. The decorative containers segment of the container glass market includes artifacts and decorative pots made up of container glass. The global market for container glass is segmented as per glass type, container type, forming process, and end use. In 2016, the company developed a Helix packaging solution, the first cork stopper and container glass bottle with an easy-to-open and reclose technology. In September 2016, Ardagh introduced two new American beer container glass bottle models (500ml). Ardagh Group and Owens-Illinois, Inc. together are estimated to account for around 1/4th of the global container glass market share. Key players operating in the global market for container glass include Ardagh Group, Gerresheimer AG, Owens-Illinois, Inc., Hindusthan National Glass & Industries Limited, Nipro Corporation, Vidrala S.A., Vitro, S.A.B. de C.V., Nampak Ltd., Becton, Dickinson and Company, Consol Glass (Pty) Ltd., Saverglass SAS, BA Glass, Adelphi Healthcare Packaging, Wiegand-Glas GmbH, Schott AG, Stevanato Group, ?i?ecam Group, Beatson Clark Ltd., Piramal Glass Limited, and AGI Glasspack Limited. In this report, Transparency Market Research offers an 8-year forecast of the global container glass market between 2018 and 2026. In terms of value, the global container glass market is expected to expand at a value CAGR of 5.0% during the forecast period. The study reveals the dynamics of the container glass market in five geographic segments, along with market analysis for the current market environment and future scenario over the forecast period of the global container glass market. The global container glass market report begins with the executive summary for various categories and their share in the container glass market. It is followed by market background section which includes market dynamics, an overview of the global packaging market, TMR analysis of the market drivers, restraints, opportunity analysis, and trends that are affecting the growth of the container glass market. Furthermore, to understand the popularity of the various container glass segments, an attractiveness index and BPS analysis with elaborated insights on the same is provided, which will show the market’s attractiveness based on factors such as CAGR, incremental opportunity, and estimated market share in 2018. To show the performance of the container glass market in each country and region, BPS and Y-o-Y growth analysis are provided. The global market for container glass is further segmented as glass type, container type, forming process, and end use. On the basis of glass type, the global market for container glass is segmented into Type-1, Type-2, Type-3, and Type-4. On the basis of container type, the global container glass market is segmented into packaging, tableware, and decorative containers. The packaging segment is further segmented into bottles, jars, and vials & ampoules. The bottles segment is further categorized into sauce/syrup bottle, French square bottle, Boston round bottle, and other bottles. The jars segment is further categorized into Mason jars, hexagonal jars, Paragon jars, straight-sided jars, and other jars. Vials & ampoules segment is categorized into food grade and pharma grade. The next section of the report highlights the container glass market by region and provides the market outlook for 2018–2026. The study investigates Y-o-Y growth regionally, as well as analyses the drivers that influence the regional container glass market. The main regions assessed in the container glass market report include North America, Latin America, Europe, Asia Pacific, and Middle East & Africa (MEA). The report evaluates the present scenario and growth prospects of the regional container glass market for 2018–2026. To ascertain the size of the container glass market in terms of value and volume, the revenue generated by key manufacturers and their respective production capacities are taken into consideration. The forecast presented here assesses the total revenue generated by value, across the container glass market. In order to provide an accurate forecast, we initiated by sizing up the current market, which forms the basis of how the container glass market is expected to develop in the future. Given the characteristics of the container glass market, we triangulated the outcome on the basis of three different types of analysis - based on the supply side, downstream industry demand, and economic envelope. In addition, it is imperative to note that, in an ever-fluctuating global economy, we not only conduct forecasts in terms of CAGR, but also analyse the container glass market based on key parameters, such as year-on-year (Y-o-Y) growth rates, to understand the predictability of the container glass market, and identify the right opportunities across the market. The market segments for the global container glass market have been analysed in terms of basis point share (BPS) to understand the individual segment’s relative contribution to market growth. This detailed level of information is important for identifying various key trends in the container glass market. Another key feature of the global container glass market is the analysis of key segments in terms of absolute dollar opportunity. Absolute dollar opportunity is critical for evaluating the scope of opportunity that a provider can look to achieve, as well as to identify potential resources from a delivery perspective of the container glass market. The overall absolute dollar opportunity along with the segmental split is mentioned in the global container glass market report. Transparency Market Research has developed the container glass 'Market Attractiveness Index'. The resulting index should help providers identify real market opportunities. In the final section of the container glass market report, a 'dashboard view' of the companies is provided to compare the current industrial scenario and their contribution to the total container glass market. Moreover, it is primarily designed to provide clients with an objective and detailed comparative assessment of key container glass providers specific to a market segment. Container glass report audiences can gain segment-specific manufacturer insights to identify and evaluate key competitors based on the in-depth assessment of their capabilities and success in the container glass marketplace.